Thanks to a project initiated by the French comics artist Frédéric Boilet, a short story by Fabrice Neaud has been at least published in English (and, incidentally, in Japanese, Spanish and Dutch). In this book, 'Japan', Frédéric Boilet has invited 17 artists, French or Japanese, to write stories about various Japanese cities, either their hometown (for the Japanese artists) or cities they had visited (for the French ones). Thus we can read pages by, beside Fabrice Neaud, Moyoko Anno, Aurélia Aurita, Frédéric Boilet, Nicolas de Crécy, Étienne Davodeau, Little Fish, Emmanuel Guibert, Kazuichi Hanawa, Daisuké Igarashi, Taiyô Matsumoto, Benoît Peeters, David Prudhomme, François Schuiten, Joann Sfar, Kan Takahama and Jirô Taniguchi. Nearly all of them are famous alternative comics artists in their native land. The question is: is this story, 'The City of Trees', a good way to discover the work of Fabrice Neaud? Of course, it is a bit short (20 pages) and does not let the artist develop a vast and ambitious storyline, as in Journal (I) or Journal (III), for instance. The art is very fine, full of the maturity it has progressively acquired along the years. 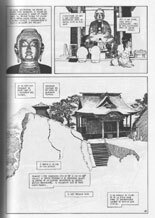 There is an interesting alternence of very realistic drawings of landscapes or buildings (see the temple below) and of cartoon-like people (Fabrice Neaud riding a bike). He uses mainly the realistic style for the subjective views and the cartoon-like one for the self-portraits. Both styles merge perfectly together. This story interweaves Fabrice Neaud's wandering to discover the city of Sendaï and its surroundings and more personal thoughts, that revolve about two main topics: his misanthropy, his difficulty in dealing with people around him and Antoine, a guy he is love with.